A quadrilateral ABCD has diagonals that are perpendicular bisectors of one another. Which of the following classifications must apply to quadrilateral ABCD? If the diagonals of a quadrilateral are perpendicular bisectors of one another, then the quadrilateral must be a rhombus, but not necessarily a square. Since all rhombi are also parallelograms, quadrilateral ABCD must be both a rhombus and parallelogram. This figure is a rhombus with a side of 8 in. What is the area of the rhombus (in2)? In order to determine the area of a rhombus you either need a base and a height OR the length of the two diagonals OR the base and an angle. Because we are only given the base with no information about the height, there is not enough information to determine the area of the rhombus. The perimeter of the rhombus is . By drawing the diagonals, we create a right triangle with the hypotenuse as and the side as . Since we know that is a phythagorean triple, we can infer that the third side is . What is the perimeter of the rhombus (in)? 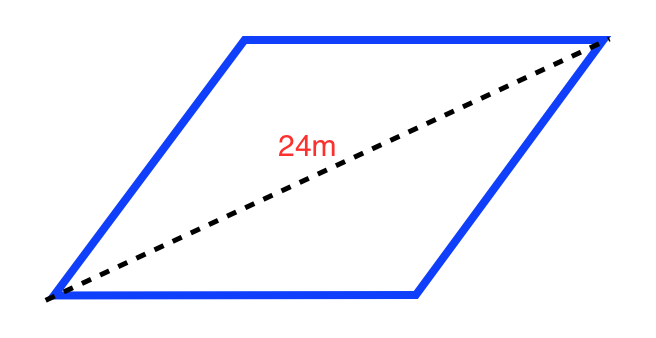 The perimeter of the rhombus is the distance around the outside of the figure. Since a rhombus has 4 congruent sides, the perimeter is simply . You are given a rhombus with a side of meters. What is the perimeter of the rhombus? A rhombus is a quadrilateral ( sided figure) with congruent sides. The perimeter is the sum of the sides. Thus, to find the perimeter of the rhombus, we multiply the perimeter by . This gives us meters.